Generally, isomerization is the process of involving the change of one structure into another having the same emperical formula but with different properties in one or more respects. A plethora of alkaloids contain one or more asymmetric carbon atoms in the molecule, and hence exhibit optical activity. It has been observed that in the majority of instances only the (–)- isomer (i.e., the levorotatory component) has appreciable and distinct pharmacological activity than the corresponding (+)-isomer (i.e., the dextrorotatory, component) of the same alkaloidal species. 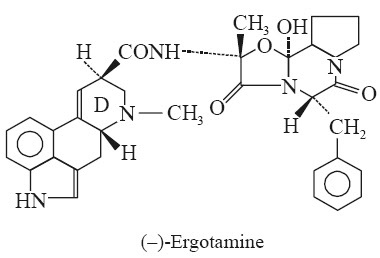 At this juncture, one needs to understand clearly the traditional designations l- and d- for the levo- and dextro- rotatory isomers respectively; and these are to distinguished from the designations L- and D- which refer not to the optical activity, but to the steric configuration with regard to a conventionally accepted reference compound. In fact, the optical activity is invariably associated with the alkaloids and their respective salts. However, the optical activity and the specific rotation usually varies with the solvent used, the temperature, the wave length of light and other minor factors. 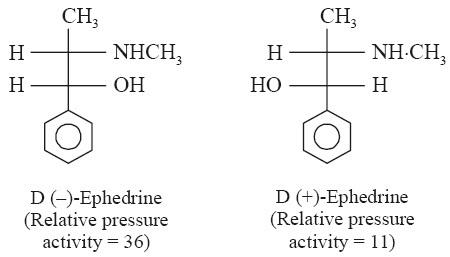 There are quite a few typical and glaring examples that may serve to illustrate the considerable difference in the pharmacological activity observed amongst the different isomers of an alkaloid. * Increase of arterial blood-pressure.